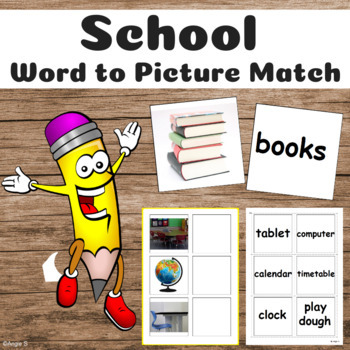 Word to Picture Match Bundle for Autism, Special Ed, Speech Therapy, Occupational Therapy, ESL.It can be so hard for early age and students with autism to learn vocabulary! These activities will help your students improve their vocabulary through an easy task by matching words to real life pictures! 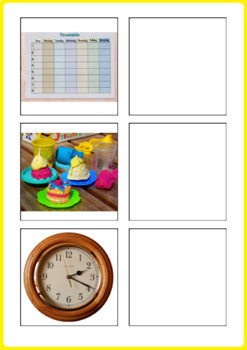 Matching word to picture is an activity that develops vocabulary, reading and spelling skills. It is good also for kids with autism and special needs. 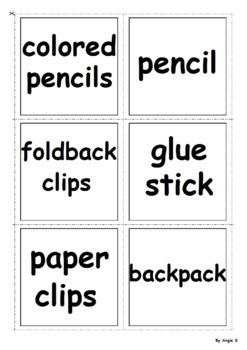 The 48 words included are: teacher, school bus, classroom, school, children, books, backpack, crayons, glue stick, markers, paper, table and chair, desk and chair, play dough, easel, paints, paintbrushes, letters, numbers, shapes, balls, tablet, computer, library, calculator, abacus, calendar, clock, chalk, blackboard, eraser, colored pencils, pencil case, ruler, pins, notebook, sharpener, tape, globe, playground, foldback clips, paper clips, scissors, whiteboard, stapler, timetable, pen, pencil. The pages must be printed and laminated. Use some velcro in the middle of the blanc squares on the first 8 pages. Cut the cards with words out from the last 8 pages and use velcro on the back side. Being a follower of my store you`ll learn about my new products, sales and discounts! Become my follower by clicking on the green star on any of my pages and receive email updates in your TPT inbox.